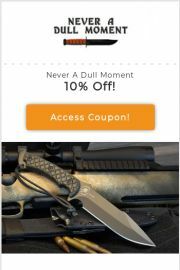 If you’re looking for the best Never A Dull Moment coupons, you’re in the right place! Never A Dull Moment Knife Shop has been involved in the knife business for more than 20 years. Their Knowledge and expertise of the products they sell and the consultation and teaching techniques they use, set them apart from the rest! They are Branson’s exclusive dealer of Oakley Standard Issue eyewear. They also offer many other exclusive items in store only. Their customer service is unmatched and you are provided with a pleasant environment, with quality being foremost in product and service. You are treated like a person, not just a dollar sign $$ and there is always a knowledgeable staff member available to help you select the item for your needs, whether work or play! Hoping you’ll be fully satisfied with your experience at Never A Dull Moment…a SHARP place to shop!